This Savory biscuit is tasty crunchy flour chips made out of wheat flour or Maida. 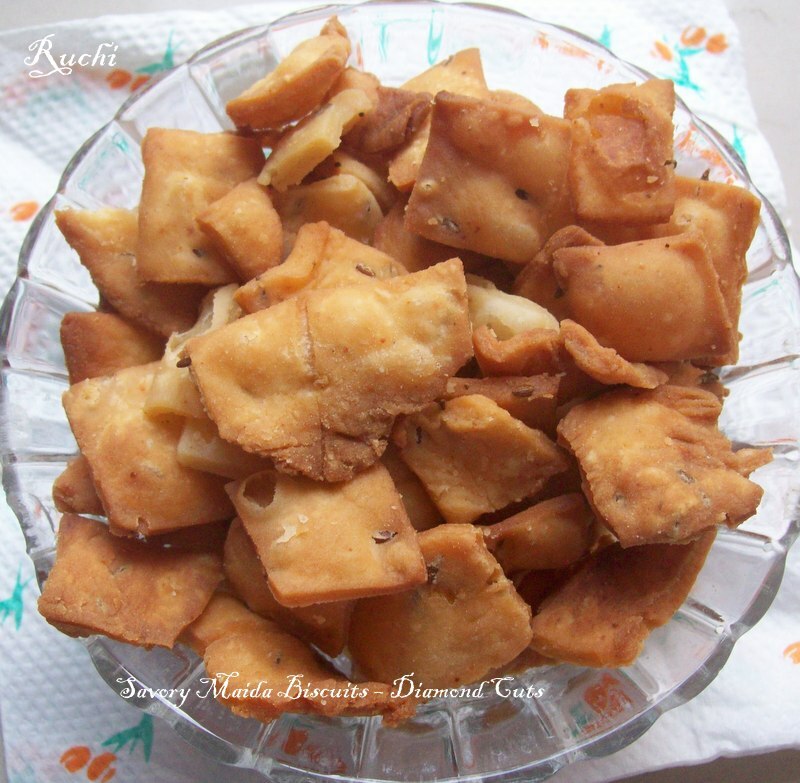 It is one of the easiest snack recipes which can be prepared at home with very few ingredients. It is a perfect tea time snack. I prepare both sweet and salted version of this biscuit. This recipe is very easy to prepare and I used to do whenever if we think to have some crunchy snacks. 1.First mix butter /ghee and cooking soda cream together vigorously well with your hands . 2.Then add maida, chilli powder, jeera, hing and salt. Add water very little at a time and knead into a firm ball of dough. 3.It should not be sticky, just moist. Add more flour and knead in if your dough is too sticky. Set aside. 4.Heat oil for frying. Then Take Pinch off a lemon-sized amount of dough and roll into a ball between your palms. 5. Roll into a thin circle neither too thin nor thick and cut into diamonds with a sharp knife . 6.Gently lift the pieces and add to the hot oil and deep fry it in batches till golden brown. Allow it to cool. Then store it in an airtight container. Crunchy munchy diamond cuts, love it.